NB: I’ve now added this trip to the main section of guiding website, Expeditions Alaska. By all means, browse this page, but please also visit the trip page here. This coming year, 2010, I’m running a new phototour to Katmai National Park and Preserve; we’ll be basecamping in remote southwest Alaska, photographing grizzly bears, dawn til dusk, for a week. Katmai National Park is home to some of the largest grizzly bears (or “brown bears” as they’re often called in that region) in the world. Feeding largely on salmon from some of the richest salmon runs in Alaska, the bears are magnificent creatures and there’s no better time to photograph them than in the fall. This trip offers an unsurpassed opportunity to photograph wild grizzly bears in a remote and brilliantly wild setting and promises some simply incredible photographic possibilities. – Trip #1: Sept 19-25, 2010. Return Charter Flight from King Salmon to our camp. For more information or to make a booking, either please use this Contact Form. The Katmai area was declared a National Monument in 1918, and in 1980 the boundaries were greatly extended and the region declared a National Park and Preserve. At 4.2 million acres it stands a sizable chunk of land set aside for the preservation of an amazing abundance of wildlife, sovereign of which is the grand old Grizzly bear. Katmai National Park and Preserve lies southwest of Anchorage on the Alaskan Peninsula, and is arguably the greatest grizzly bear viewing and photography location in the world. The prodigious salmon runs attract and support a grizzly bear population density that is among the highest in the world. It’s also among the safest place to photograph wild grizzly bears, given their plentiful food sources and tolerance of human presence; the bears are generally extremely tolerant of people, and this combined with the high bear population (approx 100 bears in the area in Sept 2009) makes it possible to shoot literally thousands of photos in a few short days. The beauty of a fall trip is that we get the place largely to ourselves; in 2009, over 2 weeks, there were no other photographers in the area the entire time. Bear population density in the area increases dramatically in the fall as food sources concentrate. Nearly 100 bears were in the area fall 2009. Due to the very high number of young females in the area, it is expected that 2010 will be a great year for sows and cubs in this area, which are always a treat to photograph. We’ll have the opportunity to photograph bears of all sizes, from massive 1000 pound boars to tiny young spring cubs: walking, running, fighting, playing, fishing, napping, climbing, swimming, etc, etc. As fall winds up, the bears look better and better; their coats fill out, the bears fatten up and lose their shaggy, lean summer look. Some males will gain as much as 500lbs in a few short months gorging on rich Sockeye Salmon (also known as red salmon) and Coho Salmon (silver salmon). The vibrant peak fall color of the transitional boreal forest provide a backdrop as photogenic as any; photography in the fall here simply can’t be beaten. There are often various other species of animals in the area, including mink, fox, wolf, lynx, least weasel, occasionally moose, and a variety of birds, including 3 species of gulls, magpie, bald eagle, Common mergansers. However, our concentration will be on grizzly bears in the prime time of their yearly cycle. All you have to worry about is photographing the great bears, from sunup to sundown. Your and the bears’ safety is paramount, and we maintain a “safety-first” standard at all times. We go through a thorough safety talk before the trip, and closely adhere to the most current protocols on safe travel in bear country. Safety-first means caution, it means responsibility and it requires an excellent knowledge of the area: the terrain, wildlife, backcountry camping, etc. Your guide is also a certified Wilderness First Responder. We make a concerted effort to not harass and/or disturb the wildlife. A smaller group size not only ensures you the photography opportunities you need but also that our group doesn’t bother the bears. We understand the difference between nature photographers and the paparazzi, and will neither approach too closely nor stay too long. Respect for the subject is absolute. By keeping our group size small, your trip remains about you and your photographic experience with the bears. Group size is restricted to 5 participants; exceptions will only be considered on a case by case basis. We think group size is a critical part of the experience, and don’t like to see hordes of photographers bunched around a subject, crowding and pushing for photos. In order that we maximize your time in the park, we will meet in King Salmon, Alaska, and take a charter flight from there to our camp before lunchtime (as such, it is best if you schedule your arrival in King Salmon the day before our trip begins). We’ll get a chance to shoot the first afternoon and evening, then have 5 more full days of shooting, before our final night in camp. We then have a few hours to shoot in the morning before a midday charter flight back to King Salmon. It’s only a little more than a one hour commercial flight from King Salmon to Anchorage, so most folks can be back in Anchorage that evening if they wish. Expeditions Alaska provide high quality, comfortable tents with an electric fence around the campsite. This trip will be outfitted completely, all camping gear other than your personal gear (sleeping bag, clothes, etc) will be furnished; we take care of food and shelter, with our own camp cook. We have solid, secure gear and food caches, plus weather-protected wooden shelters for inside dining in wet weather; even in harsh weather the camping is more than comfortable. If you need assistance with any gear, please don’t hesitate to ask. We carry a satellite phone, as well as both First Aid and Basic Life Support kits. With 10 years of experience photographing Grizzly bears and many trips to Katmai National Park, as well as guiding extended remote wilderness backpacking trips, Expeditions Alaska owner Carl Donohue works impossibly hard to ensure trip participants have a safe trip and a fantastic experience. The advantages of being a local Alaska business include knowledge of the place; the relationships of the history, the geography and ecology of the area, promising trip participants a fascinating adventure. We offer a first rate trip because we keep it small and we maintain the utmost respect for the places we visit; this translates to an unforgettable photo tour that we’re more than sure you’ll absolutely love. You can read more about Carl and Expeditions Alaska on the About Us page of this website. This trip is perfect for the intermediate to advanced or professional photographer looking for a small group to join for a week of concentrated grizzly bear photography. The photography requires some walking, so being in reasonable shape is important. Special attention is given to capturing unique and creative grizzly bear photos, so we make the extra effort to put ourselves in the best spots to shoot from. By camping on site, we’re able to be in place to photograph during the best light, rather than on a boat or in a lodge. Meals will be scheduled around our photography, ensuring we don’t miss any great light or bear action. Carrying long telephoto lenses, plus other camera gear, we’ll walk several miles each day, but it is hard work – you’ll be tired at the end of a long day, and ready for some great food and good times by the campfire. Chest waders are necessary, for both safety and optimal photography opportunities – we (and the bears) spend a good deal of time in the water. 2 camera bodies are optimal, and you’ll also want to bring plenty of extra batteries, memory cards (or film), backup storage, warm clothing, rain gear, and a range of lens choices, from wide to telephotos. All that and a bundle of enthusiasm will make your trip a memorable and successful one. For more information or to make a booking, please use this Contact Form. 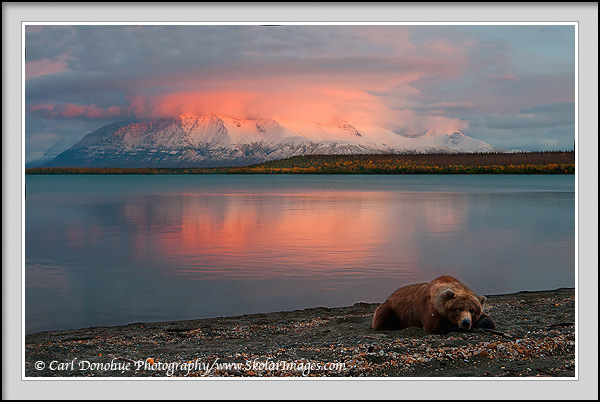 This entry was posted in Adventures, Alaska, Fall, Grizzly Bears, Katmai National Park, Landscapes, Photo Tours, Travel, Wildlife and tagged Brown bears, Expeditions Alaska, Grizzly Bears, Katmai National Park, Katmai National Park and Preserve, photo tour, Ursus arctos on November 12, 2009 by Carl D.
That top photo is flat awesome Carl!! Good luck with the tours. WOW, the top one is a jaw dropper Carl. Could be an all time favorite of mine. Diggin the rim light on the last as well. Though probably not next year, I foresee myself being a future client on great sounding tour of yours. Thanks Guys. Oh, and Mark, the backlit one isn’t the last in the series. If you click on the image, there are 8 more photos in the slideshow. That’d be awesome if you can come up again some time, Mark. It’d be a blast to go shoot with you.